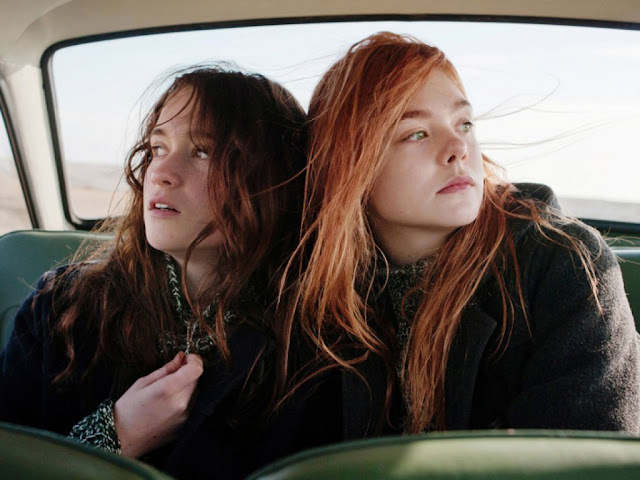 Teenage besties Ginger (Elle Fanning) and Rosa (Alice Englert, of Beautiful Creatures) are inseparable, so close and linked they're practically sisters. Change is coming, though, and in 1962 London, Ginger finds herself pulled and captivated by the threat of nuclear warfare. She fancies herself a poetess and brings Rosa to protests, chattering purposefully about the impending end of the world. Their nights out are mash-ups of growing up, all the cold realizations alongside all small mistakes. Ginger's social-consciousness is contrasted with Rosa's interest in boys, parties, and strange trust in the power of prayer. Director Sally Potter returns from an extended absence, and Ginger & Rosa is a slip of a narrative powered by the intensity of its emotions and stark purity of its camerawork. Elle Fanning is the true star here, and as Ginger spends her life waiting for the bomb - or the other shoe- to drop, we get close-up after close-up of her ability to silently articulate the severity of the situation. Though soapy drama abounds, Ginger & Rosa is saved by Fanning's performance and the richness of the cinematography.